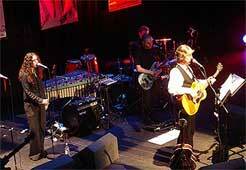 The band for the IN OTHER WORDS tour consisted of Willy (lead vocals & guitar), Tim (lead vocals & keyboards) and Andy Roberts (vocals & guitars) plus Dorie Jackson (vocals), Emily Jackson (vocals, bass & keyboard), Gavin Kaufman (vocals, bass & keyboard) and Vidar Norheim (vocals, drums, percussion & vibraphone). Loreto Murray also joined later in the tour (vocals & accordian). Emily, Gavin and Vidar were (in 2004) students at the Liverpool Institute of Performing Arts LIPA. 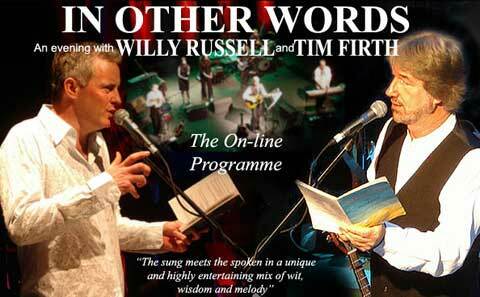 An on-line programme was created to coincide with the tour. Over the course of the 10 dates photos from each gig, comments and reactions from members of the audience and the press were added on a continuously basis. Click here to see the on-line programme.